As the temperatures got colder in PA, Wyomissing decided to go get some sun and heat in Orlando at the Disney Invitational. The Wyomissing boys finished 3rd in the 1A division with a score of 98 points. Kyle Shinn led the way for Wyomissing, taking the gold medal by just under two seconds, running 17:34 for the win. The Wyomissing girls had great success, taking the girls 1A team title with a score of 37 points. Devi Jagadesan finished 2nd overall in a time of 19:55, just missing the gold by three seconds. 1st Annual Colonial XC Invitational-Canceled for 2012. PA took away two championships in the boys championship race! 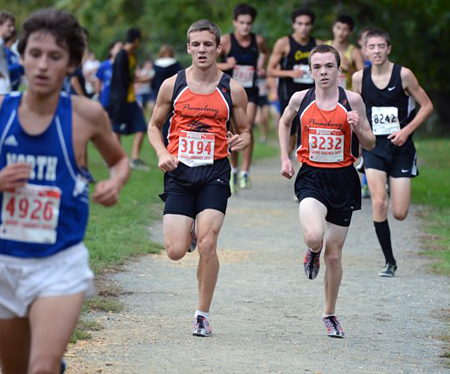 Connor Harriman of Pennsbury continues his amazing senior season, running 16:11 to edge out the gold medal by a photo finish! Teammate, sophomore Sam Webb, was 9th in 16:23. In the team standings, Lasalle bursted through and came away with the team title by a narrow 4 point margin over Northport 117-121! Jack Magee finished 16th to lead the way for the Explorers. Lasalle had a 30 second spread from their first five runners. Greencastle Antrim earned a narrow victory over Mountain Ridge 51-57 to win the small schools girls team title in the 3-Mile race. A 1-2 finish from champion Caroline Schemel (19:51) and runner up Shelby Stouffer (20:19) helped secure the victory. New Oxford won the large school title in another tight finish over Middletown MD 33-38 with four in the top ten overall, led by a 3rd place finish from Emily Lawrence (20:39). For the boys, Waynesboro finished 3rd in the large school race with 97 points led by an 11th place finish from Clay Foreman (17:42). The Hill School boys were victorious by just three points over Owen J. Roberts and four over Oley Valley. Hill placed three in the top nine, led by a 6th place finish by Preston Tietjen in 17:59. Owen J. Roberts' Steve Daliosio won in 17:23. In the girls race, William Tennent easily outdistanced the field with just 22 points, placing six runners in the top eight. They were led by sophomore Karlie Brasch, 2nd in 20:27. Oley Valley's Olivia Boyer won in a time of 20:27. Maplewood boys had the best relay team with a time of 16:06, 27 seconds better than New Castle. West Middlesex won the team title on a tie breaker over Maplewood, with both teams scoring 27 points. For the girls, West Middlesex had the top two relay teams on their way to the team title. Wissahickon won the team title over Twin Valley on the 6th runner tie breaker with both teams scoring 69 points. Plymouth Whitemarsh was 3rd with 71 points and Souderton finished 4th with 77 points. Connor Linse of Souderton defended his home course with a gold medal winning performance of 16:16 to win by 15 seconds. For the girls, Kara Steinke of Methacton set a new course record with a winning time of 18:05 to win by nearly 30 seconds. Central Bucks West continued their hot running, placing five in the top 14 to cruise over Central Bucks South 40-106. Somerset Area captured 3rd in the varsity boys race behind the 7th place 17:13 by junior Ravi Desai. 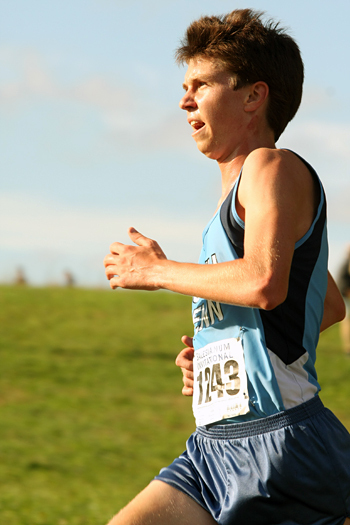 Teammate Nick Bastian, also a junior, was ten seconds back in 9th place. Freshman Hayley Roher led the Somerset girls to a 6th place finish with her 8th place 20:28. Maddy Clahane of Cumberland Valley won another invitational gold medal, running 19:22 to win by 17 seconds over teammate Carol Strock. The 1-2 finish was crucial, as Cumberland Valley escaped with the team title over a game Carlisle squad 66-67. Carlisle placed all seven runners in front of Cumberland Valley's number 5 runner to make it close. For the boys, Vinny Todaro of Big Spring earned his 3rd win this season with a comfortable win in 16:10 to win by 21 seconds. Cumberland Valley won the boys title with some breathing room compared to the girls, placing five in the top fifteen to win 50-74 over Carlisle. Cardinal O'Hara boys had a big dominating performance for the 3rd consecutive season to repeat as county champions. O'Hara finished 1-2-3-4-9 with a 45 second spread to score 19 points. It was the 2nd straight year they scored under 20 points. 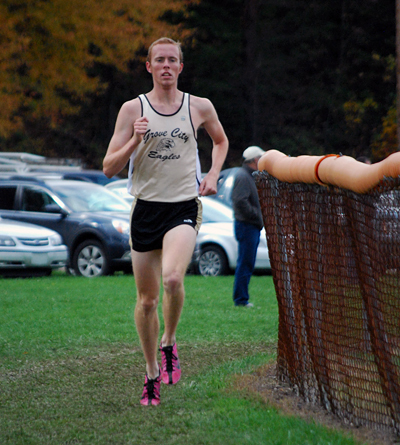 Dan Savage repeated as county champion with a time of 15:57. Teammate Kevin James was 2nd in 15:59. For the girls, Strath Haven repeated as county champions, narrowly defeating Cardinal O'Hara 65-71, placing four in the top ten. Tess Meehan of Haverford won the county individual title with a time of 18:44 to win by 17 seconds over Ariane Abadi of Radnor. DELCO CHAMPS!! Sponsored by the DELCO RRC---SATURDAY 10-6-2012 Rose Tree Park 38th year!!! STRATH HAVEN won last year in an upset over HAVERFORD and NOTRE DAME. The 2012 race appears to have 4 teams that will climb 2-Mile hill in an effort to become the DELCO CHAMPS. HAVERFORD was 2nd last year and won in 2010. They have a strong TOP 2 and need their pack to move up. OHARA beat STRATH HAVEN and HAVERFORD at Briarwood and also have a strong TOP 2 and are always competently led by the coaching of one of the few married couples pleasantly leading a team together! RADNOR has shown great improvement this year and could spring an upset! STRATH HAVEN made big strides in both the Bull Run Invitational(MD) and at Paul Short and their TOP 4 all have a chance of being in the TOP 13 at the meet! STRATH HAVEN on paper appears to be the team to beat!! A STRATH HAVEN runner has won the individual championship 4 of the last 5 years(Frick 2007--Rutkowski 2008--Grossman 2010, 2011). There will be 20 plaque winners and the TOP 7 girls are likely to make 1st team DAILY TIMES ALL-DELCO. 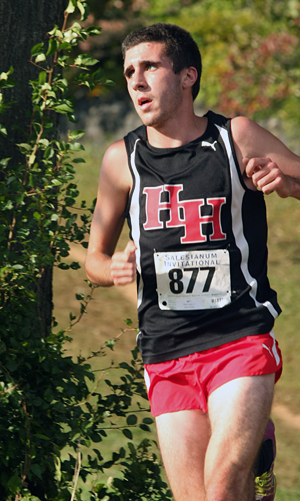 The highest returning finisher is Meehan (HAV 12) who has improved every year placing 10th, 5th, and 4th last year. Meehan just recently beat Rudawsky (GARV 12) after losing to her twice this season. Rudawsky(Vicki Huber’s daughter)(27th,7th,7th) has been running well and it should be a great womano/womano battle! Two other girls have a shot at the title. Abadi (RAD 11) who finished 34th last year is turning in some outstanding performances(winning BULLDOG and 2nd at CARLISLE). 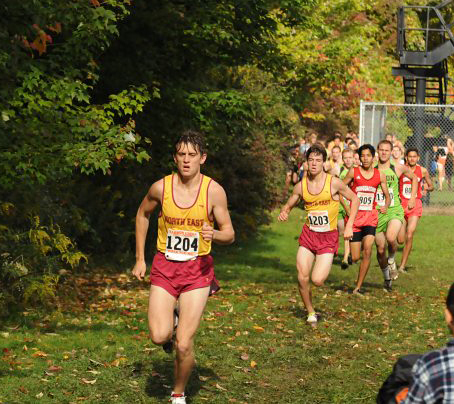 Mancini (OH 9) was a CYO standout and had a great race at PAUL SHORT last week. Besides those TOP 4 there are 9 other girls who will storm up the finish line hill and try to beat the others to the famous Rose Tree Park gazebo! !Those girls with last year’s finish are Chang (PC 12)(6th), Naser (HAV12)(14th), Kelly (OH 11)(15th), McGroarty (GARV 11)(16th), Snyder (SH 11)(19th), Puchalsky (SH 11)(JV 1st), Flynn (ACAR 12), Herrera (SH 12), and Mesyngier (SH 9). OHARA! OHARA! OHARA!---Last year’s team victory at DELCOS was unbelievable! Their Top 5 finished 1st, 3rd, 4th, 5th, and 6th after finishing 1st, 3rd,4th, 5th, and 7th the year before. Historically, OHARA has dominated the DELCO XC CHAMPS. Coach Tom Kennedy’s harriers have been FIRST 9 of the last 14 years!! This year OHARA is ranked #1 in PENNSYLVANIA(they are looking to win the BIG ONE--STATES--after finishing 2nd last season). No DELCO team(and likely PA team) is even close to them this year. OHARA will make more TEAM HISTORY this Saturday! At least there may be a TEAM race for 2nd!? PENNCREST looks to be 2nd best as they are dominating Central League meets and running well in week-end invitationals. HAVERFORD, RADNOR, and STRATH HAVEN have an outside chance for 2nd. Lets look at some more HISTORY. 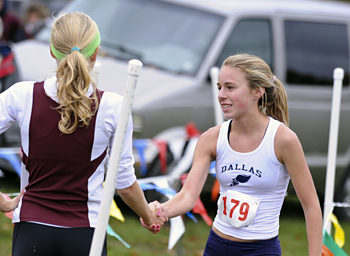 An OHARA runner has been the DELCO Champ 8 of the last 12 years(including 2011). The top 2 finishers, Savage (OH 12) and Huemmler (SH 12) return from last year’s race to likely do battle with OHARA’s other #1, sophomore James(12th). Savage and James have faced tougher courses and competition, but Huemmler’s closing speed could provide an upset! As for the DAILY TIMES ALL DELCO Boys’ selections, there are 8 others challenging for 4 more spots. Among them are Bodine(HAV 12)(13th), Fowler(HAV 11)(20th), M.Kazanjian(PC 11)(24th), C.Kazanjian(PC 11)(NOVICE 5th), McDermott(MB 12), and 3 OHARA runners--Pitone(12)(6th), Hayes(12)(JV 8th), and Belfatto(11)(JV 1st). They cheered when the sun finally made a cameo appearance Saturday at the Grove City Invitational. They did again when Grove City’s Daniel Jaskowak put together his finest performance to date on his home course, leading the PA Class AA#4 boys team to a near-perfect 17 points and a team championship. The senior covered the first mile in 4:50, with sophomore teammate Aaron Benka eight seconds back. After a tour through the wooded section of the course, Jaskowak’s lead had ballooned to 32 seconds as he hit the two-mile mark in 10:03. His advantage continued to grow as he stopped the clock in 15 minutes, 37 seconds, a personal best by 23 seconds on the Memorial Park layout. With Jaskowak leading the way, Sample’s Eagles passed their final test with ease before PIAA qualifiers get under way. Benka (16:36) and fellow Grove City sophomore Ryan Budnik (16:59) were the next two to finish as Grove City had five of the first six, seven in the top 10 and a 28-second spread for runners 2-5. “This is our home course, and we just went out there and took advantage of knowing what we have to do on our course,” Sample said. “The guys are working hard together, and we’re making sure they are peaking at the right time. Plum was led by Ed Amori’s eighth in finishing second with 53 points and a 1-5 spread of just 32 seconds. Chartiers Valley was third with 114. While the locals dominated the boys’ race, a team from the suburbs of Buffalo – West Seneca West – made a 2-1/2 hour drive worth it by walking off with the girls’ team championship. Emilio Mancino’s Indians nipped Grove City, 65-74, thanks in large part to a back-to-back-to-back finish by runners 3-5. “We have a young team that’s a little inexperienced (so) we try to get out of the area because we see a lot of the same teams all the time,” Mancino said of the reason for the out-of-state trip south. “You’ve got the outlets here. Our team deserves it. It was just a nice little getaway for us. Freshman Bailey Kessler paced the winners in third, while freshman Katie Jaskowak led the hosts with a sixth. 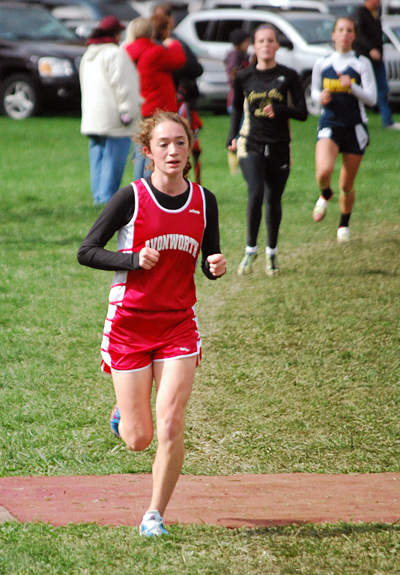 Although her margin of victory was not as great as the boys’ champion, Avonworth’s Beth Shenck was in control of the girls’ race. A course softened and muddied in spots by overnight and morning rain didn’t phase the junior as she crossed the line in 19:59, with freshman Danielle Frank of Trinity 18 seconds back. Although spectators had to keep her on course at one point Saturday, Shenck knows the way to Hershey and is looking forward to the chance to be part of the Class A state final. Led by race winner Daniel Jaskowak, Grove City (PA Class AA#4) dominated the boys’ field at their invitational Saturday, while West Seneca West made the trip south from Buffalo to edge the host Eagles for the girls’ team title. Jaskowak posted a course PR of 15:37 in leading Mike Sample’s team to victory as Grove City’s 17 points easily bested runner-up Plum’s 53. Teammates Aaron Benka (16:36) and Ryan Budnik (16:59) were the next two to finish as Grove City had five of the first six, seven in the top 10 and a 28-second spread for runners 2-5. The difference for West Seneca West in its team victory was a back-to-back-to-back finish by runners 3-5 as the Indians totaled 65 points to Grove City’s 74. 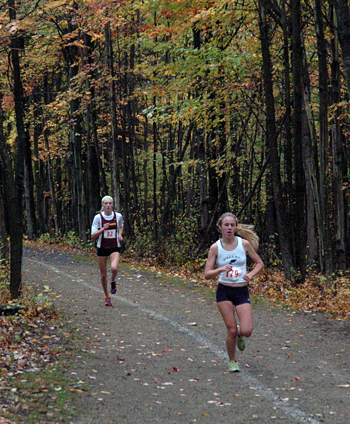 Freshman Bailey Kessler paced the winners in third, while freshman Katie Jaskowak led the hosts with a sixth. Avonworth’s Beth Shenck led through both checkpoints, crossing the line as the winner in 19:59. Bernadette Prichard of Villa Maria Academy added another impressive performance to her freshman cross country season with a gold medal winning performance of 18:50 to win by 19 seconds over Alyssa Brandis of Central Cambria. Her performance also led her team to a big team title victory, scoring 26 points with five in the top twelve overall, defeating McDowell by 58. For the boys, Ryan Smathers earned his 3rd victory of the season, running 16:39 to win by 21 seconds over teammate Gary Olson. Their 1-2 finish was good enough to lead their team to victory over Cathedral Prep 56-70. PA#2 North Allegheny boys got their month of October off to a flying start with a convincing win in the varsity A race. The defending district 7 champions scored 27 points led by a 3rd place finish from Matt McGoey (16:13) and a 1-5 spread of 14 seconds, the best from any team this season! District 7 rivals Mount Lebanon finished 2nd with 69 points. Ean Disilvio of Taylor Allderdice ran 16:00.1 to win the gold medal of Ethan Martin of Fox Chapel by seven seconds. In varsity B, Albion scored 51 points with four in the top ten to win by 34 over Beaver Area. Jake Deweese of Freedom (7) won the gold medal with a time of 16:24.8 to win by just under 4 seconds over Marshall Bruce of Beaver Area. For the girls, Mount Lebanon continued their strong running this season, taking home the varsity A title with a score of 61 points to defeat Chambersburg by 52. Brianna Schwartz ran 18:30.5 to win the gold medal by 5 seconds over Mary Malone of North Hills. In varsity B, Knoch edged out Freeport 46-53 with four inside the top ten overall to cancel out an individual title performance from Kayla Zboran (19:43.20) who won by 3 seconds over Dee Dee Adams of Freedom (7). This is Kennedy Weisner's home district course. It is Adare Gennocro's home district course. Regan Rome's home district course is over three hours to the east, in Dimock, PA, north of Scranton. So when the murmur rippled through the fans gathering for the Ridgway Invitational on the District 9 home course that District 2 defending champ, and 2012 Foundation Blue Race champ Regan Rome of Dallas was there, the anticipation could do nothing but increase. The reasons were obvious. Rome was looking for competition. But the new classification adjustment in PIAA cross country made for some interesting assumptions. Adair Gennocro of nearby Saint Marys was in AA. Rome had been moved from AAA to AA. 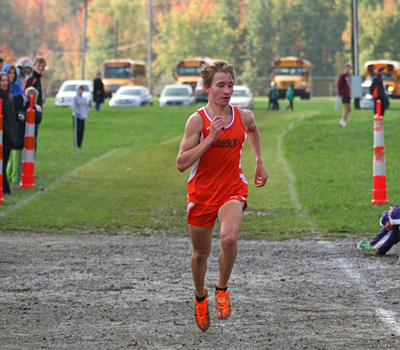 Weisner had been runner-up for two consecutive years in AA cross country. Gennocro had been 3rd for two consecutive years in AA cross country. But Weisner was now Class A. So why did Rome come west on the day of her homecoming dance? Simply, to see where she was with her main AA competition, Gennocro. But she was also looking for as much competition as she could find. She had been disappointed in her 3rd place finish at PTXC4 on September 8th - behind champion Weisner and runner-up Greta Lindsely of AAA Penn Manor. So Weisner was on her radar. But Gennocro was her measuring stick for this race. As it turned out, Rome's race at Ridgway showed she measured up well. Going out with Gennocro, both were trailing a fast-starting Weisner, who was on a fast-opening mile training run. But by halfway, Rome had shed her AA rival, and had closed on Weisner. Approaching the two mile, Rome was in the lead. Unsure of the strength of that lead after Weisner had set a course record at the huge McQuaid Invitational the week before, Rome continued to push. Weisner was at the end of a tough week of training, but she readily acknowledged that Rome was the better on this day. Rome closed to a course record of 18:15.4, with Kennedy in at 18:41.0, a PR on the course, also breaking the CR of Gennorco, who ran 19:04.6. In the boys race, there were two top harriers absent to tale their SATs, but they don't' award points for test-taking at a cross country meet. In their stead, Elk County Catholic senior Ryan Detsch took the opportunity not win his first invitational in 16:55.9. The recently awarded Eagle Scout used the confidence gained from this Boy Scout experience to push through the hills and capture this first major invitational. Regan Rome of Dallas made a late solo appearance and came away with a course record! Rome ran 18:15.4 to win by over 25 seconds against previously undefeated Kennedy Weisner of Elk County Catholic. Adair Gennorcro of St Mary's ran 19:04 to finish 3rd. 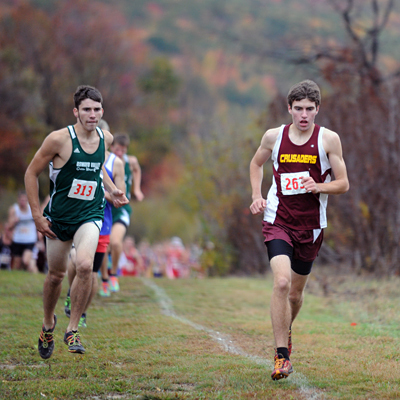 For the boys, Ryan Detsch of Elk County Catholic earned a narrow victory over Chris Hunt of Kane Area. Detsch's time of 16:55.9 was good enough for a 12 second win. PA represented well on the tough Brandywine Course. Jack Macauley of North Penn won the boys championship race with a time of 16:25 and he won by a comfortable 12 second margin. Macauley's performance is the 4th fastest time in the history of the competition! Top PA team performance went to Great Valley. They finished 3rd behnind host school Salesianum and runner up Georgetown Day School with 88 points, 18 points behind the champions. Matt Willig and Billy Wolffe finished in the top ten for Great Valley. In the large school race, Conner Quinn of Hatbor o Horsham ran 17:04 to earn a comfortable win of his own. Conestoga edged out William Tennent 81-86 with help from a runner up performance from Andrew Marston to win the team title. In the small school race, Malvern Prep made a strong case for a top five AA poll spot with a big win 51-87 over West Deptford. Jaxson Hoey and Billy McDevitt finished in the top five to lead the way for Malvern. For the girls, Anna Willig finished 2nd in the championship race with a time of 20:04 and led her team to a 4th place finish. North Penn was the top PA team with a 2nd place finish of 63 points, 11 points behind Oakton (VA) led by a 7th place finish from freshman Phoebe Clowser. Archbishop Wood finished 3rd with 78 points. In the large school race, Coleen Butler of Upper Merion finished 10th in 22:06 and her performance led her team to a narrow team title victory over Conestoga 87-95. In the small school race, Baldwin School finished 4th with 155 points led by a 7th place finish from Miriam Jaiser (21:41). Gabe Trimbut of Coudersport won the gold medal in the small school boys race with a time of 17:25.4 to win by just over 4 seconds. Teammate Courtney Rodgers finished 13th in the girls small school race in 23:06.3. 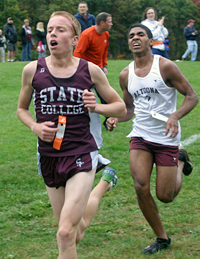 State College sophomore Matthew Beyerle (9th place, 17:25) edges out Altoona's Terry Futrell (10th place, 17:30) to help secure the State College boys team's win in their invitational. State College finished with 25 points, just ahead of Altoona with 30 point, to set up a dual meet rematch in Altoona on Tuesday, October 9. Shikellamy (93) and Hollidaysburg (102) also competed. 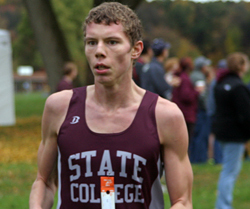 State College junior Will Cather was the individual winner, going 16:34. Altoona sophomores Brad Foust and Dominic Stroh went 2-3 at 16:52 and 16:53, respectively. 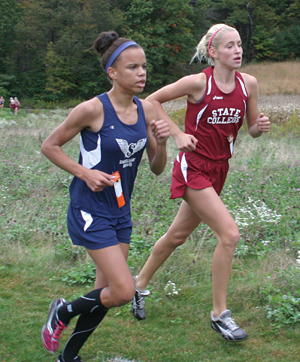 Shikellamy's Treicy Cedeno runs alongside of State College's Natasha Fedkina. Fedkina went on to win with a time of 19:42. Cedeno finished second in a time of 19:50. State College was a 23-44 team winner over Altoona. Council Rock North swept both individual titles, as Kate Scott (20:14) and Mac Emery (16:48) earned victories in comfortable fashion. Emery's boys sqaud also won the team title with a score of 23 points with five in the top ten overall. Scott's girls team were missing their number 5 runner and Downingtown East was able to come away with the team title by one point, 35-36. 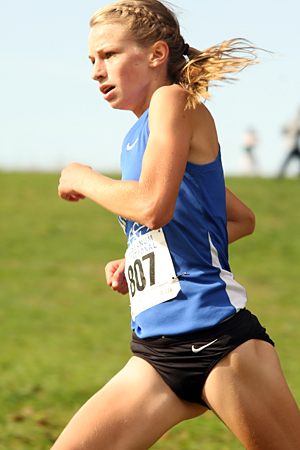 Katelyn Callaghan led the way for Downingtown East with a 3rd place finish. The stage was set Saturday for a meeting of one of western Pennsylvania’s hottest and fastest runners of 2012 and one of Ohio’s 1,600-meter run champions from a year ago. As has been the case this season, it turned into another race against the clock for Corry Area’s Austin Pondel in The Legends Meet at the Trumbull County (Ohio) Fairgounds. The senior was left to go it alone at the front because of an unexpected no-show, dominating the Division III race with a 15:59.8. “Yes, the course was very muddy and sloppy with quite a bit of standing water,” said Pondel, who won by more than 30 seconds and had the day’s best time by almost 22. “People were saying that course was flat and, ha, it really is. I believe that it was probably 20-35 seconds slower with the mud. I just tried to make sure I didn't fall or twist anything. Pondel was able to put about 70 meters on the field in the first 1¼ miles. All Tim Nichols of South Range could do was run for second, crossing in 16:31.9. “Yea, even with a no-show, it was still a really fun meet and course,” said Pondel, whose time is one of only 5 sub-16:00 clockings in meet history. Curtis Royek of Corry Area was eighth in 17:32.4 as the Beavers finished sixth with 194 points. Ohio-ranked Gilmour Academy won with 52 points as The Legends Meet is Corry Area’s last before the District 10 regional meet on October 20. “With the championship races starting, I'm ready to show myself,” Pondel said. “The whole month of September, we had region tri-meets every Tuesday and I felt like my fitness kind of stalled with no full weeks of pure training, but this past week and next is all training and, even now, I feel like my aerobic strength has come back/gotten better.